A marvelous place for the adventurous birder and wildlife watcher, this property has more than 10 miles of hiking, biking and equestrian trails, plus a wide diversity of habitats (sand pine and oak scrub, scrubby and wet flatwoods, freshwater marsh, wet prairie, upland hardwoods, ponds and lakes). Download the park brochure/trail map prior to visiting or pick one up at City Hall or the entrance kiosk. Eighteen different trail segments range from short and easy to long and difficult. Park at the equestrian entrance off Main St. (just west of Gibson St.) for the Jays Walk, an easy hike on abandoned subdivision roads where you can observe a family of Florida Scrub-Jays and Gopher Tortoises. 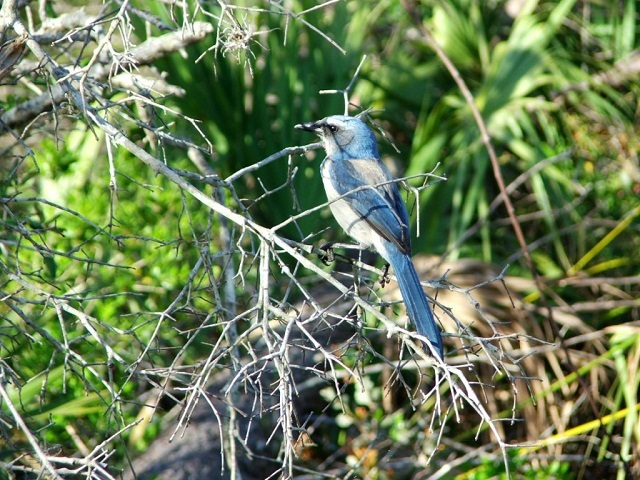 Five scrub-jay families live on the property; the Territory Trail is another good bet for this Florida endemic. Boardwalks and lake crossings from the Gibson St. and Friendship Park entrances provide additional access points to other trail loops. A freshwater depression pond on the Little Loop trail has Tricolored Herons and other wading birds. The Powerline Road Trail has ducks, and sometimes Wood Storks, Sandhill Cranes and Roseate Spoonbills. Bald Eagles and Ospreys are often seen overhead. Botanists will find many interesting species of scrub-adapted plants here. Consider biking the longer perimeter trails, and bring plenty of water and sun protection. Restrooms are available at Friendship Park.